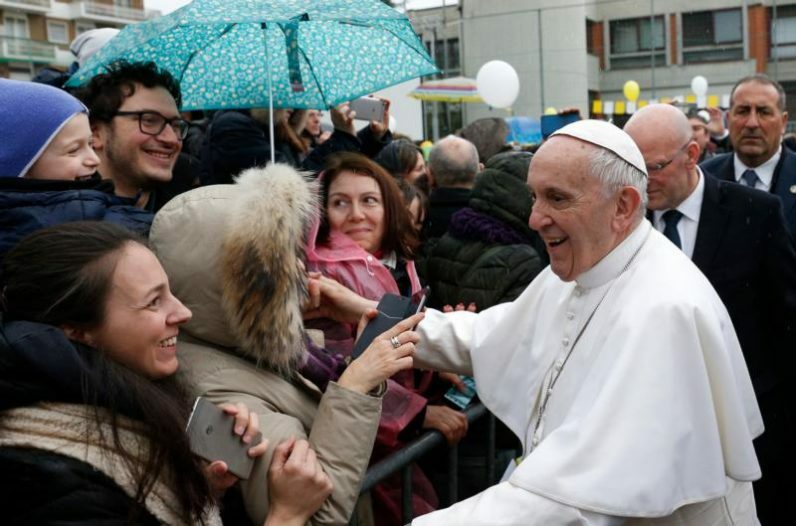 Pope Francis greets the faithful before celebrating Mass at the Church of St. Gelasius in Rome Feb. 25. (CNS photo/Paul Haring) See POPE-PARISH-LISTEN Feb. 26, 2018. ROME (CNS) — If people listen to Jesus and do as he urges them, they can be certain that he will see them through even the darkest times, Pope Francis told members of a Rome parish. “Jesus always prepares us for our trials and he never leaves us alone. Never,” the pope said Feb. 25 during Mass in the Church of St. Gelasius on Rome’s northeast edge. Following his usual pattern for Sunday parish visits, Pope Francis reached the church in the early afternoon. After shaking hundreds of hands, blessing dozens of babies and posing for a handful of selfies with young people, the pope went to the parish soccer field to meet the children and teens involved in the parish catechism and sports programs. After morning sunshine, the skies turned gray and cold, and a heavy rain began to fall. “You’re soaked!” the pope told the youngsters. “Life is like this,” he said, explaining that some days will be sunny, some rainy and sometimes storms unexpectedly blow in. “What’s a Christian to do? Go forward with courage,” knowing that Jesus always is near and is always willing to forgive, he told them. Moving indoors, the pope met with the elderly members of the parish and greeted each of them individually. He asked couples how long they had been married and asked others how they were feeling. One woman told him that she had a cold she just could not shake. He suggested she try some grappa, a strong grape-based alcoholic drink. Pope Francis thanked the group of elders for all they do for the church and the world. Even if they do not feel like they are accomplishing great things, he said, they have been charged with “keeping the embers of faith alive” with their prayers and their witness. After hearing confessions, the pope celebrated Mass in the parish church and gave a brief, extemporaneous homily focused on the day’s Gospel account of the transfiguration of Jesus. By allowing the disciples to see him transfigured, Jesus gave them a preview of the glory that would be his after the crucifixion and resurrection, the pope said. It was a way to fortify and prepare the disciples for the trials and tribulations that were about to begin. Remembering that vision, he said, the disciples would be able to “bear the weight of the humiliation” of seeing Jesus condemned and crucified.